A video of a Winstock concertgoer who got her head stuck in an exhaust pipe has received over 1 million views. 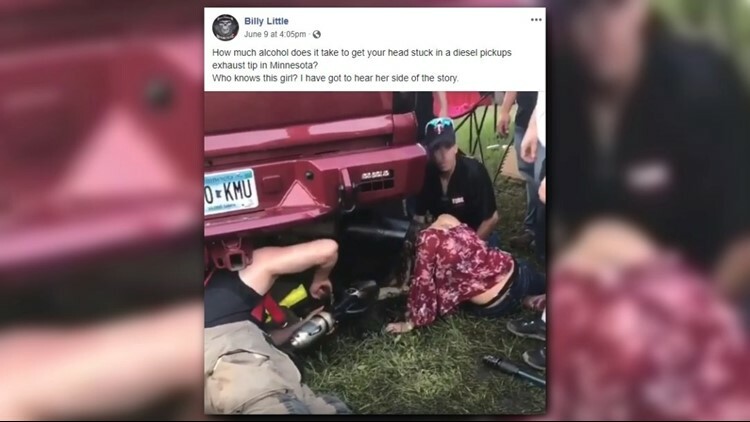 A young woman at the recently-held Winstock Country Music Festival has a story to tell... or not tell... to her kids and grandkids after getting her head stuck in the tailpipe of a truck. Yep... a truck tailpipe. WINSTED, Minn. - Apparently there IS a thing as too much fun. A young woman at the recently-held Winstock Music Festival has a story to tell... or not tell... to her kids and grandkids after getting her head stuck in the tailpipe of a truck. Yep... a truck tailpipe. At this point the details of how she got there, or what motivated the incident are unclear, but alcohol may have (wink wink) played a role. The McLeod County Sheriff's Department confirms she was cited for underage drinking and escorted from the grounds once her head was removed from the exhaust pipe, which was no easy task. The Winsted Fire Department was called in, and used a power saw to aid in the extrication. The fire chief says he was told it was the second time the young woman had put her head in the tailpipe that day. The first time she apparently was able to get out OK.
No word on whether the truck owner billed her out for the unexpected mods. The video posted on Facebook has been viewed over 1 million times. We're choosing not to ID the enthusiastic concertgoer, but she did out herself on Facebook, with a post proclaiming "Yes, I'm the tail pipe girl, whatchu know about it?."